Montgomery, a gourmet chef on the fast track to fame, has a teensy weensy problem. He's a murderous cannibal addicted to human flesh. 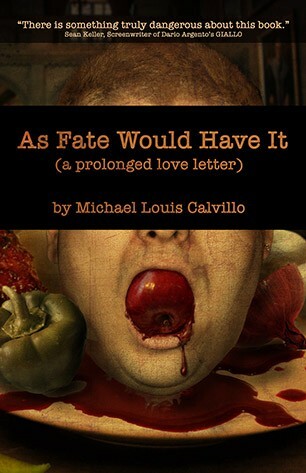 Guilt and worry eat his brain and beg him to stop, but his headstrong girlfriend Liz won't let him quit. She blames Montgomery for getting her hooked on the succulent meat and refuses to curb her carnal urges. Ashley, a twenty-something trying to figure her place in life, desperately wants to kick the nasty heroin habit she acquired with her boyfriend Henry a year and a half ago. Henry wants to make Ashley happy and quit, but no matter how hard he tries he can't seem to resist the drug's consuming pull. As Montgomery and Ashley struggle with codependence, with love, with loss, with sorrow and regret they seek to find salvation in the unlikeliest of places—each other. This two volume set will be housed in a custom slipcase. The first volume will be the novel As Fate Would Have It and the second volume will be a bonus cookbook tittled The Application of Heat featuring receipes with the buyers name in the title of the receipe. Michael went all out for this special bonus! There will also be a extra illustration not featured in the numbered edition. Nominated for a Dark Scribe award in the Small Press Chill category, and also in the Cover art category.